Register today for first aid training! So let’s take a look at pelvic injuries, how they happen and how we treat them. So what we’ve got here is a skeleton with the pelvis actually in situ in a car. The first thing to note is, when a patient gets involved in a crash, they tend to hit the clutch and the brake pedal, so they lock the legs in a straight line and that force that comes when the impact occurs travels up the legs in a straight line and the two hip joints either side of the pelvis get all of that initial impact and that pressure has to be dissipated somewhere. And the pelvis being a circle, most people refer to it like a polo mint, will always break in two places. If you drop a polo on the floor, it doesn’t crack in one place, it will always break in two. The pelvis is the same. The first and weakest point is over the pubis. Actually, where the pelvis sits over the bladder, the pubic bone is the weakest point. It’s the narrowest, thinnest, most delicate area and sitting right behind the pubis in the area here is your bladder. So one thing to remember is when we get pelvic injuries, we quite often also get bladder injuries. Pelvic injuries create the bladder problems, which can create septicaemia, peritonitis, inside the actual cavity itself, so we can get an infection, so we have to be extremely careful. Pelvic fractures also, because of the size of the bone and because of the complexity of the injury itself, do have quite a high fatality rate. And that is because of the complications that occur. If a pelvis is fractured, you won’t walk, so you’re bedridden and that gives you more risk of things like bed sores, pneumonia and everything else. It may need surgical repair so that puts you through the theatre process and hospital process and infection process. So don’t think of a pelvic injury as something quite minor. Pelvis injuries are a major trauma and have to be dealt with properly and have to be dealt with swiftly to stop the particular injury getting much, much worse during the course of extrication. So, we’ve talked about it breaking over the pubis, the other areas it tends to break is through the joint itself to the right or left of the pubis bone and it sometimes actually shatters through the back as well where the spine joins the pelvis. It can break in multiple places, but it never breaks in just one. Because it’s a big bone, it also bleeds very heavily and there is a large cavity area. So what we need to do to protect the pelvis is to support it, is to splint it or strap it to give the bone some stability so there’s no flexibility in the pelvis at all. Flexibility and fragments of bone, if we move this casualty out of this car without stabilizing them first, can rupture the bladder, can rupture blood vessels, arterial bleeds, and can make the problem 10 times worse than it was when we arrived and that is not the idea to first aid. It’s to get the patient out in exactly the same condition or better than when we found them, not make the situation worse. All car crashes can be different, all car crashes come with their own challenges, but you can see from the position you sit in the car, side impacts tend to hit the pelvis from the side with the inside of the door panel hitting the person’s pelvis. Doesn’t matter whether you’re driving or passenger, the worst impact for pelvic injuries tends to be side impacts or t-bones as we refer to them or head on, straight in front with the driver. Rear impacts tend to not do so much damage to the pelvis, because most people have got the handbrake on and the feet off the pedal, so we haven’t got that fixed rigid leg position creating the problem to the pelvis itself. But we also get an awful lot of pelvic injuries from horse riders, from mountain bikers, from road bikes, where they fall onto the road surface from a height or a high speed and the circle or the girdle of the pelvis then fractures due to the impact on a hard surface. So force from a height, a force from motorbikes will also create a high risk to the pelvis. 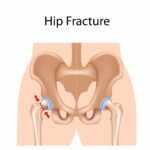 Signs and symptoms of the pelvis fracture, first of all, it is incredibly painful. The pain is intense. The patient will tell you it is absolute agony in the pelvic region. Another sign can be a loss of fluids. So we can become incontinent due to the bladder being damaged or the loss of control of the bladder sphincter, so the patient becomes moist and wet. Another impact problem can happen with the legs and the presentation of the legs. Because the muscles attached that control your legs and the way your legs are, they attach to the pelvis itself, so the presentation of the feet is also a crucial thing to look for in pelvic injuries. The feet, when you relax normally, have the toes pointing up or the patient can at least move the legs into position. With a pelvic fracture, you lose control of your muscles in your legs, so almost certainly, the patient will not be able to move their lower limbs at all and the presentation of the feet is floppy and flat and there is no movement from them. So we get no spring from the toes. Normally, your toe, if you push it to the floor, will spring back due to muscle tension, but with pelvic fractures, the muscle is no longer attached to the pelvis, the pelvis has fallen open and you don’t get the spring from the toes. Another thing is if you talk to the patient, they will tell you that it feels like the pelvis just fell open or like an open book. It’s just literally fell open and they can feel it. 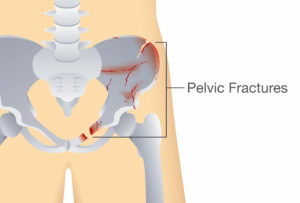 So, intense pain, feet positioning, feeling like the pelvis has fallen open, also possible incontinence are all signs and symptoms of a fractured pelvis. And remember, the fractured pelvis is a life-threatening injury and needs to be dealt with properly before we extricate the patient from the car. Pingback: Joint examination is the basic examination of any joint.